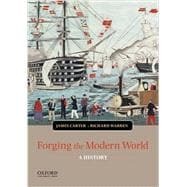 In Forging the Modern World: A History, authors James Carter and Richard Warren offer an accessible explanation of key transformations in global economic, political, and ideological relationships since the sixteenth century. The book is distinct from most world history texts in three important ways. First, it explores the ways in which historians use and produce information. Each chapter delves deeply into one or two specific issues of historical inquiry related to the chapter theme, showing how new primary sources, methodologies, or intellectual trends have changed how we engage with the past. Second, it clearly explains the political, economic, and ideological concepts that students need to understand in order to compare events and trends across time and space. Finally, the chapters are organized around global historical themes, which are explored through an array of conceptual and comparative lenses. While the book chapters proceed chronologically, each chapter is written with some chronological overlap linking it to preceding and subsequent chapters. This strategy emphasizes the interconnectedness between the events and themes of one chapter and those of surrounding chapters. A companion website includes quiz questions and flash cards for each chapter and PowerPoint-based slides for instructors. James Carter is Professor of History at Saint Joseph's University. Richard Warren is Professor of History at Saint Joseph's University. What is Revolutionary about Industrialization? Abolition, Immigration and the meaning of "Free Labor"
Economic Development and Non-Alignment: Three Worlds?